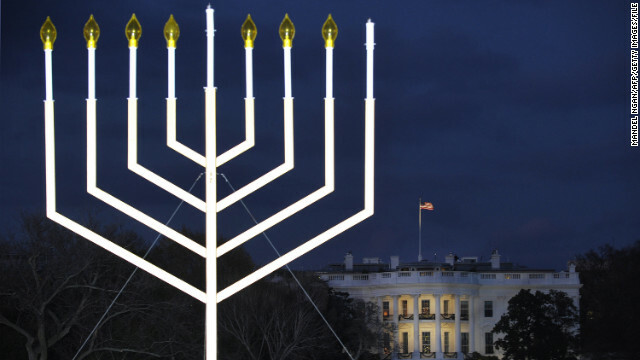 The White House is seen during the annual national Hanukkah menorah lighting ceremony in 2010. (CNN) - Americans love kitsch, and the holidays bring out the best in our love/hate relationship with products that are so bad they just might be great. Each December you can find some terror-stricken parents ambling through toy stores like zombies in search of the perfect gift for their children. But if no perfect gift can be found, you can always turn to kitsch. That awful holiday faithy kind. It's so bad it just might work. Hanukkah, the Jewish Festival of Lights, begins on Saturday. Hanukkah commemorates the rededication of the Temple in Jerusalem after the Maccabean Revolt and the menorah (candelabrum) that stayed aglow for eight days, despite a lack of oil. The holiday gift giving burden can be doubly worse for Jewish parents who have to scramble to find gifts for their children for each of the eight nights. But does your kid really need another dreidel, another bag of chocolate coins? The clock is ticking, but there's still time for the perfect faithy kitsch gift for children and the young at heart. 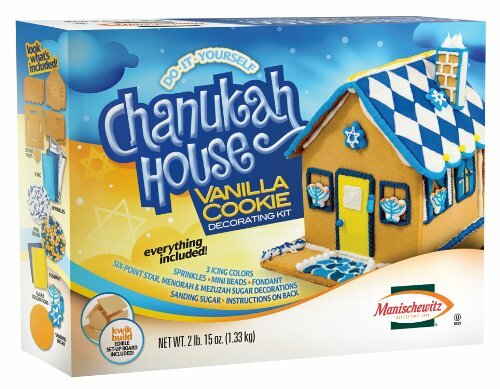 With that in mind we humbly present the Belief Blog 2012 Guide to Hanukkah Kitsch. 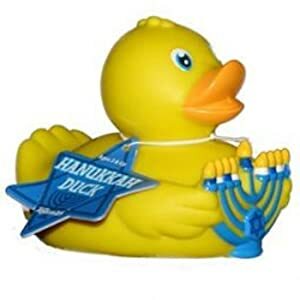 Now your children can really test the miracle of the menorah by bringing this rubber ducky into the tub. Nothing says candles like a bath. Cats played no central role in the Maccabean Revolt story, but why should cat lovers suffer for that? This horrible holiday sweater comes complete with Stars of David and the menorah in golden chocolate coin motif. It's the article of clothing that makes your kids want to stay in the car because they refuse to be seen with you wearing it. From the product description, "Firemen and Chippendales have had their spotlight long enough! The 2013 Nice Jewish Guys Calendar turns the spotlight on the underrated characteristic that pecs and tight buns can't deliver...niceness." 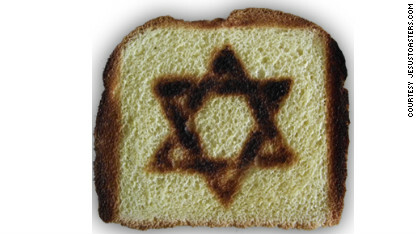 In a move of interfaith outreach, the folks who brought us Jesus toasters have created this Star of David toaster, just in time for the holiday. 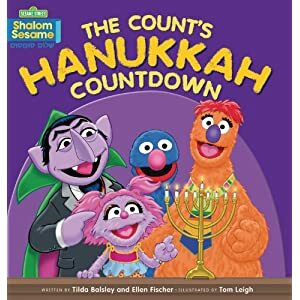 The Count counts down the eight nights. Get it? While all the other kids on the block are reading that other version of this story, now you and your family can finally enjoy the Hanukkah version. 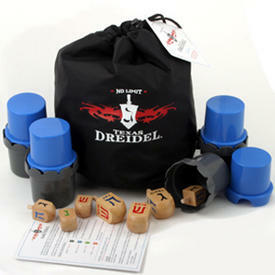 Spinning the dreidel is a classic Hanukkah game where children bet for chocolate coins. Finally a version adults can enjoy by taking the gambling to the next logical step. We've long documented the plight of Hanukkah music on the Belief Blog (see also the Maccabeats). Here's yet another entry into the holiday song canon. It's like a ginger bread house but Hanukkah. Comes complete with blue and white frosting. And don't forget to tune in next week for a very kitschy Belief Blog Christmas gift guide. Textiles commonly used include plain cloth and pile textiles like plush or terrycloth. Common stuffing materials are synthetic fiber batting, cotton, straw, wood wool, plastic pellets or beans. Stuffed toys are made in many different forms, often resembling animals, legendary creatures, cartoon characters or inanimate objects. They are often used as comfort objects, for display or collecting and given as gifts, such as for graduation, Valentine's Day or birthdays..
Firstly, these ate the lamest gifts anyone can give. Secondly, what kind of spoiled do you have to be to receive a gift each and every night of Hanukkah? Yes, the holiday is 8 days long, but I don't know anyone who gets 8 gifts. I'm Jewish, and growing up you get one gift and were grateful for what you receive. And no, my childhood wasn't so long ago that people were "simpler"; I'm 20 and I've yet to meet someone who spoils their kids with 8 freakin' gifts in one holiday. Le the CNN liberal anti Jewish hatred wash over you like a Treblinka shower. "Hanukkah, the Festival of Lights, is one of the most joyous times of the Jewish year. The reason for the celebration is twofold (both dating back to c. 165 BCE): the miraculous military victory of the small, ill-equipped Jewish army over the ruling Greek Syrians, who had banned the Jewish religion and desecrated the Temple; and the miracle of the small cruse of consecrated oil, which burned for eight days in the Temple's menorah instead of just one." "Originally a minor holiday, it has become more lavishly celebrated as a result of its proximity to Christmas." Some candles burn for weeks so the menorah "miracle" is hardly miraculous. Rabbi Wolpe can probably give us his take on the historical validity of Hanukkah. As per most contemporary NT exegetes, his parents were Mary and Joseph although some say Jesus was a ma-mzer, the result of a pre-marital relationship between Mary and a Roman soldier. Jesus was not born in Bethlehem at least the one we are familiar with and there were no pretty wingie thingies singing/talking from on high, no slaughter of the innocents by Herod, no visiting wise men and no escape to Egypt. Mark's gospel, the most historical of the four gospels, does not even mention the event. And from Professor Gerd Ludemann in his book, Jesus After 2000 Years, pp. 269-272, "The historical yield of the Lukan infancy narrative in respect to the birth of Jesus is virtually nil (ditto for Matt. 1: 18-25, Matt. 2. 1-23)"
Conclusion: Christmas is historically a non-event. Ditto for the Feast of the Magi and the solemnity of Mary aka New Years day. "Kwanzaa, which will be celebrated for the 47h time in 2012, was established by Dr. Maulana Karenga. The seven-day festival (December 26 – January 1) is secular, not religious, and aims to strengthen African cultural ident-ity and community values while providing a spiritual alternative to the commercialism of Christmas." How about a wonderful children's Hanukkah book that promotes tolerance and diversity? "Freedom Doesn't Just Come Along with a Tree" is told from a boy's perspective when he is the only Jewish child in a classroom where all the decorations are for Christmas. It also has the "best latkes on the planet" recipe and all sorts of great back material. There's a story about it in the Press Democrat today at http://bit.ly/WOlU4K. My cousins and I built the Hanukkah house on Thanksgiving and it was so fun! It even comes with a candy mezzuzah! Gave a 6 pound smoked ham to my Jewish brother-in-law one year. He thanked me for the lovely "roast beef" and proceeded to "dig in". That roast beef didn't last two days. That was not a smoked ham. That's what my mother always called the ingredients (pork, shrimp, etc) of the egg rolls we ate every other Thursday night when the housekeeper had her night off. You know what the best thing about being a Reform Jew is? SIX POUND SMOKED HAMS.